The Houston Astros are 2017 World Series champions with a playoff run for the ages. It’s over. They did it (and I called it). My hot streak of picking championship games/series lives on thanks to one of the grittiest postseason runs in the history of professional sports. Maybe that’s a bit melodramatic, but it’s certainly up there. Consider that the Houston Astros were coming off of a non-playoff season in 2016. They had never won a World Series, and had only been once, when they were swept by the Chicago White Sox. There was that whole Sports Illustrated cover thing that no one believed would come true. And yet here they are, world champions after taking down the mightiest of the mighty: the Red Sox, Yankees, and Dodgers. Carlos Beltran has his first World Series ring in this his 20th season. Justin Verlander has joined the club after a dozen years in Detroit and coming up short on the grand stage twice. And yet, this team won 101 games and ran away with the AL West because of a core of young players that is going to be very good for a long time. When the playoffs started, it was hard to envision this. Three previous teams had tried to beat both the Evil Empires, the Yankees and Red Sox, in the same postseason. All three teams failed, and all three times either the Yankees or Red Sox went on to win the World Series. Throw the Dodgers in, and this was as much of a grind as you could imagine. With the Astros winning this World Series, a number of Fall Classic trends continued from recent years. For the ninth year in a row, the team that came in “hot” — i.e., had fewer days off before the World Series — won. For the ninth year in a row, the World Series winner had to rally from a postseason series deficit at some point along the way. For the third straight time, the road team won Game 7, and never trailed in that game. I’ll be the first to tell you or agree with you that the Stanley Cup is the hardest trophy to win in professional team sports. Four rounds, 16 games, multiple overtimes — that’s an unparalleled grind, especially when you consider the evenly-matched competition. But the World Series is next on that list, and seems to be exponentially more stressful than the NFL or NBA playoffs. With football, a team that gets a bye needs to win two games to reach the Super Bowl, and only one home game to reach the sport’s final four. Think about a team like the 2008 Pittsburgh Steelers. They never have had to beat the Patriots to get to the big game, and that year Tom Brady was sidelined by a torn ACL. The Steelers’ Super Bowl “run?” Home win over the 8-8 Chargers, home win over a rookie quarterback in Joe Flacco, and a neutral-site win over the 9-7 Cardinals. That’s almost like watching the Cleveland Cavaliers take on the Eastern Conference. What the Astros did was magical on many levels. To win a championship despite one of the all-time worst postseason bullpens is a credit and then some to A.J. Hinch for finding a way to turn his starters into shutdown relievers. They overcame going a measly 3-6 on the road in the playoffs, including a three-game sweep at Yankee Stadium, which is hard to fathom. They are the second team ever to lose seven games in a single postseason and still be crowned champions, joining the 2011 Cardinals. There was wonderful symmetry along the way for the Astros. They won their first two playoff games against the Red Sox by an 8-2 score. They won their first two ALCS games against the Yankees by a 2-1 score. They won the only two extra-inning games they played, in the World Series against a Dodgers team with a supposed huge advantage in the bullpen department. And last but not least, the Astros kept alive one of my favorite growing trends that I have labeled “got hot and forgot.” The last five years, the World Series winning teams (and there have been plenty of examples of this in other sports, as well) all got off to very fast starts. The 2013 Red Sox began 20-8. The 2014 Giants were being hailed as champions when they opened 42-21. The 2015 Royals used their AL pennant win from the previous season as a springboard to a 7-0 record and later a 27-15 mark. The Cubs began 2016 with the most torrid pace imaginable at 25-6. And the 2017 Astros opened the year 42-16. Because this is baseball and no one can sustain those records over a 162-game pace, all of those teams hit speed bumps. None was more drastic than the 2014 Giants, who went 46-53 over their last 99 games and got into the playoffs as the NL’s second wild card. The 2015 Royals were nearly eclipsed by the white-hot, David Price-led Blue Jays. And the Astros looked dreadful and, frankly, bored by August, especially when they were swept by the lowly White Sox. But in the end, every one of these teams went from a hot start to a forgotten stretch to a World Series champion. For all the talk about “it’s not how you start, it’s how you finish,” well, I wrote an article about that too that’s worth checking out. A long season is finally in the books. The Astros, not one of the usual, big-market suspects, are World Series champions. Just hold onto that tightly when we hit January and the media is fawning over yet another Super Bowl appearance by Tom Brady after the Patriots go on a Super Bowl “run” with wins over the Blake Bortles-led Jaguars and the eternally-scared-of-New-England Steelers. Remember that the Astros not only won the World Series, but they took down all the massive powers along that way. Apparently, every once in a while, we do get a happy ending in sports. Enjoy it while you can. 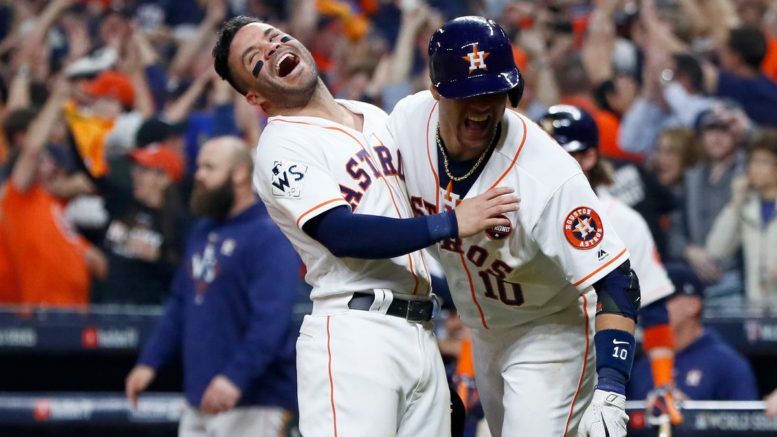 Be the first to comment on "Recapping an epic World Series, and Appreciating a True Postseason Run For the Ages By the Astros"